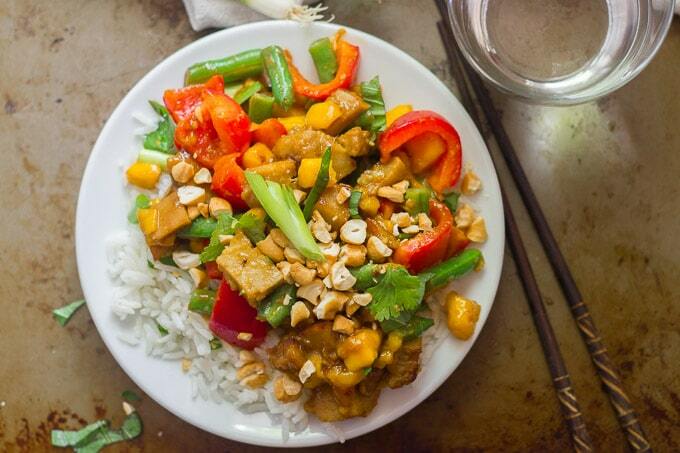 This sweet and savory Thai-inspired vegan mango “chicken” is made with tender-crisp stir-fried green beans and bell peppers with sweet mango chunks. Serve with rice and a sprinkling of fresh herbs and crunchy cashews for a flavor-packed vegan meal! Thai is most definitely one of my favorite cuisines, if not my absolute favorite. This dish is an unusual one for me though, as I usually go for curries. In fact, this dish would be one of those instances where I veganize a dish that I’ve never actually tried the conventional version of. I’ve never had mango chicken. In fact, haven’t had chicken in a couple of decades and Thai wasn’t on my personal menu back when I was twelve. But I have noticed that Friends and family members who order the Mango chicken when we go out for Thai always rave about it. So I figured it was time I give it a try. In vegan form, obviously! I made my vegan mango chicken with seitan. Tip: with just about any recipe that calls for chunks or strips of chicken or beef (think curries, stir-fries, tacos, etc. 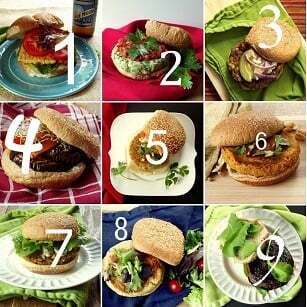 ), you can veganize the recipe by swapping out seitan for the meat. It generally requires a bit less cook time (seitan is technically already cooked), but that’s about it! I used my homemade seitan (the chicken seasoned variety) for this one. You’ll start by tossing the seitan in some cornstarch, and then pan-frying it. The cornstarch forms a nice crispy coating on the seitan as it cooks. When it’s nice and crispy, take the seitan out of the skillet and put it on a plate. Turn up the heat and add some ginger and garlic. Cook them very briefly to avoid burning. Then, in with the bell pepper and green beans. Stir-fry for just a couple of minutes, until they’re tender-crisp. Finally, in with the mango and the sauce. You can return the seitan to the skillet at this point too. Let it cook for just another minute or so, until the sauce forms a nice coating on everything. Remove the skillet from the heat and add in some fresh cilantro, basil and scallions. I served my vegan mango chicken with coconut rice. The combination was excellent! If you’re not into seitan or are gluten-free, try subbing some cubed extra-firm tofu for the seitan. You’ll also want to sub tamari for the soy sauce to keep the dish gluten-free. This dish is best served immediately, since the crispy coating on the seitan won’t hold up for very long in the sauce. If you think you’ll have leftovers, you can either skip the coating and pan-fry the seitan bare, or just store the seitan separate from everything else and mix it up right before serving. Choosing a good mango is key! Look for sweet smelling and brightly colored mangoes without many brown spots. The flesh should give a little bit when pressed on, but too much squish usually means the mango is past its prime. Feel free to sub your favorite veggies for the green beans and peppers. Keep in mind that harder veggies may need additional cook time, while softer ones will cook faster. 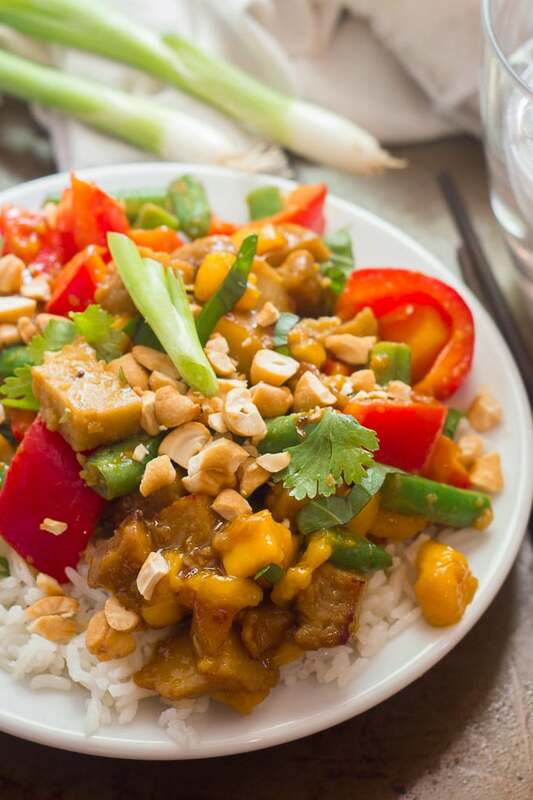 This sweet and savory Thai-inspired vegan mango "chicken" is made with tender-crisp stir-fried green beans and bell peppers with sweet mango chunks. 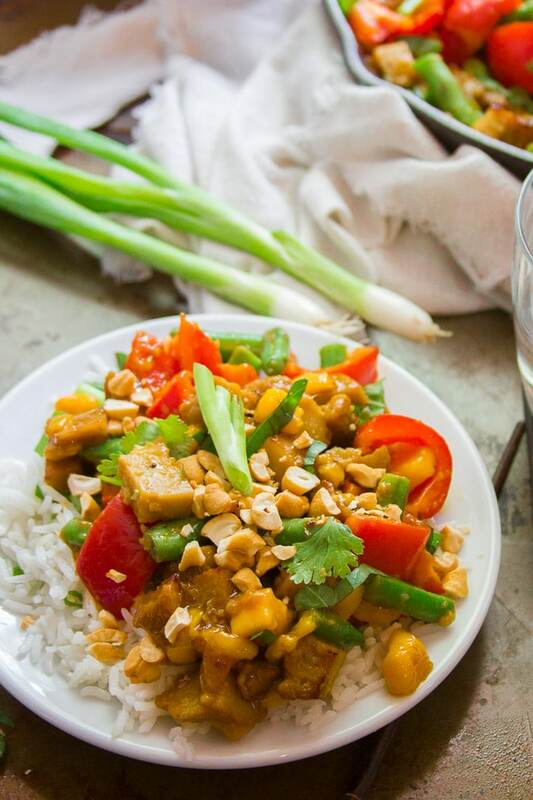 Serve with rice and a sprinkling of fresh herbs and crunchy cashews for a flavor-packed vegan meal! Whisk all ingredients for the sauce together in a small bowl. Set it aside. Place the seitan into a medium bowl with the cornstarch and toss a few times to coat the seitan. When the oil is hot, add the seitan in an even layer. 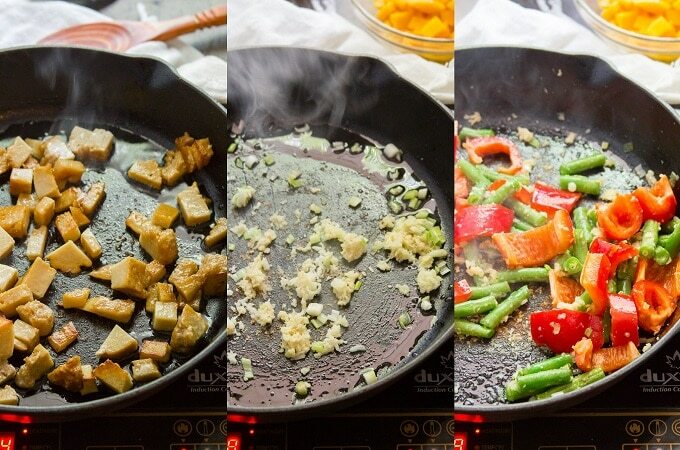 Cook for about 10 minutes, flipping once or twice to achieve browning on multiple sides. Transfer the seitan to a plate. Add the garlic, ginger and white parts of scallions to the skillet. Sauté for about 1 minute, until very fragrant. Turn up the heat to high and add the bell pepper and green beans to the skillet. 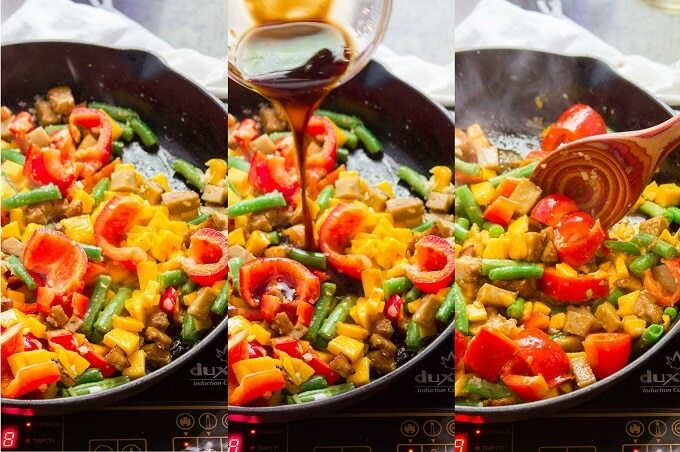 Stir-fry for about 2 minutes, until the veggies are tender-crisp. 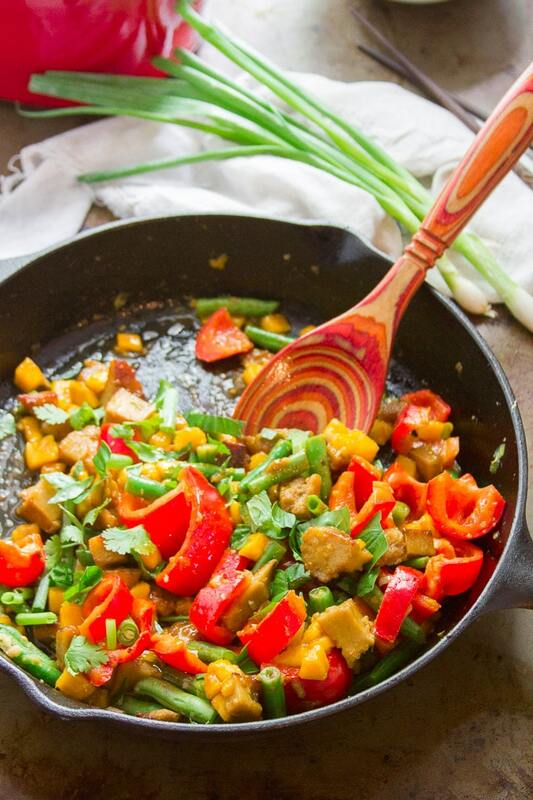 Return the seitan to the skillet and add the mango and sauce. Flip everything a few times with a spatula and continue to cook for about 1 minute more, until the sauce is thick and coats everything. Remove the skillet from heat and stir in the basil, cilantro, and green parts of scallions. Divide onto plates with rice and sprinkle with chopped cashews. Serve. hey! i found your blog really awesome ! Awe…thanks so much! Glad you like it!!! This looks heavenly! We just made up some seitan to freeze so I think we might try this out for dinner soon! Mmmmmangoes!! Oh nice! Somehow I never thought to make my seitan ahead and freeze it – thanks for the idea. I hope you enjoy this!!! This was a great recipe! Loved these flavors. I’m glad you enjoyed it!! Thanks Morgan!